Regis St. Mary strives to meet the educational needs of each student by focusing on the spiritual, intellectual, physical and creative development of a student’s gifts and talents. Students are encouraged to strive for the best education possible. To graduate, a student must earn a minimum of 25.5 credits. One-half credit represents one semester of successful course work. 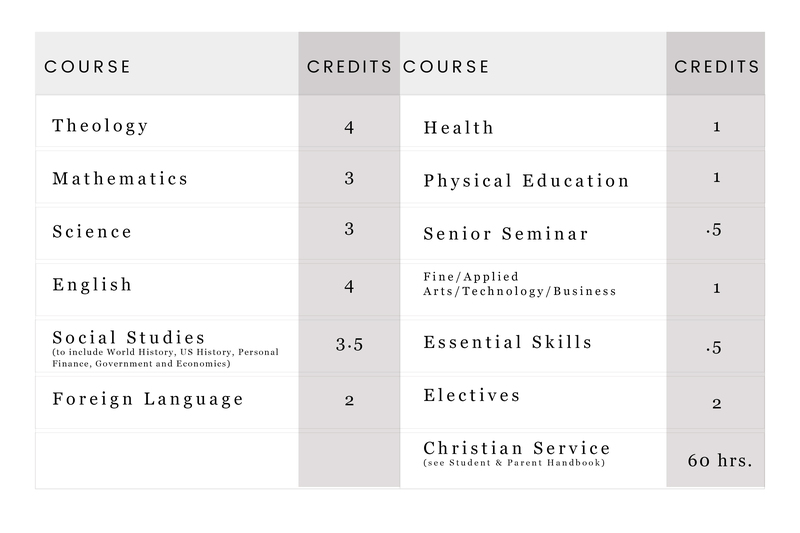 A full schedule consists of seven classes per semester. Develop fine motor skills: play dough, scissors, writing utensils, etc. Science Tools – magnets, prisms, magnifying glasses, etc. Take care of his/her own basic needs: clean up, put away mat, fasten clothing, use tissue as needed, etc. Match number with a set of objects. Compare yourself to another by size, coloring, etc. Safe Dating- taught by a representative of the Marion County Health Department, students learn how to recognize and avoid abusive dating situations or potentially abusive situations, and how to remove themselves from such situations.